Many years ago, I wrote an article for an industry newsletter on the merits of using surveys as a lead generation vehicle. Today, almost a decade later, surveys are still an effective way to generate leads from a cold list, but in addition, they can also serve as a key component of an ongoing lead nurturing or installed base marketing strategy. We’re building surveys into most of the lead nurturing programs we design for our clients. Taking the pulse of your customer base or contact database yearly or even quarterly not only helps expand profile data for those contacts, but it’s a very efficient way to identify those customers or prospects who are short-term opportunities and yet who may not respond to more promotional offers. 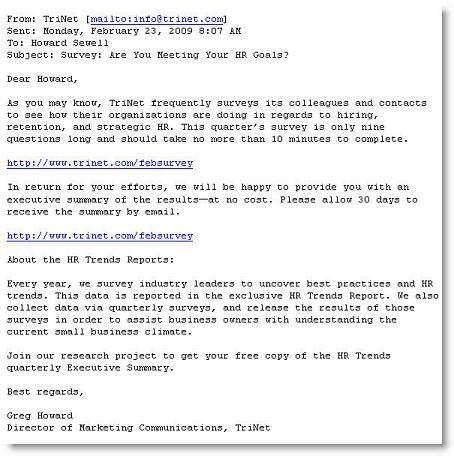 What I like particularly about TriNet’s approach, besides the very concise email, is that the offer is both specific and compelling: the email tells you how long the survey is and how long it will take to complete, and offers an executive summary of the results as an incentive to respond. TriNet also does a nice job positioning their company as a thought leader in the outsourced HR space by describing how their quarterly survey report is used by the SMB community. Surveys are an ideal medium for companies who may be short on informational content, since, in essence, they create their own content in the form of the survey results. As Greg points out, those results can then be leveraged not only for PR, but also for Webinars, content syndication, blogs, and even SEM and other online campaigns. There are a number of inexpensive, hosted survey tools on the market (Zoomerang and SurveyMonkey are two of the most popular) that can make hosting an online survey, and even tabulating the results, absurdly simple. Or you can choose to use a marketing automation tool like Marketo, which may not have some of the same survey-specific functionality (e.g. automatic tabulation), but will enable you to post answers to survey questions directly into your CRM system. A tool like Marketo can also alert sales reps automatically if prospects answer survey questions in a manner that you’ve defined in advance as representing an opportunity that merits follow-up. This entry was posted in B2B Marketing, Demand Generation, Installed Base Marketing, Lead Management, Lead Nurturing, Marketing Automation and tagged b2b demand generation, Demand Generation, Installed Base Marketing, lead generation, Lead Nurturing, marketo, Marketo consultant, Marketo partner, marketo survey on February 24, 2009 by Howard Sewell.